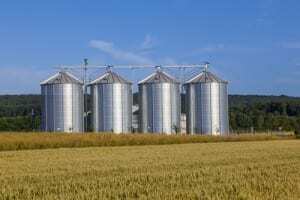 The USDA reported larger than expected inventories of corn, soybeans, and wheat in its September 1st Stocks Report, which analysts call bearish for the markets. The corn supplies came in at 2.14 billion bushels, which is 138 million more than the last estimate of old-crop carryout. USDA says feed usage was likely smaller than expected, reducing the number of bushels that made their way out of storage and off the farm. September 1st soybean inventory is estimated at 438 million bushels, 43 million bushels higher than the previous estimate. In coming up with the number, USDA says the 2017 soybean crop was 19 million bushels larger than expected, upping last year’s yield to 49.3 bushels per acre nationwide. USDA raised its all-wheat production estimate by seven million bushels to 1.88 billion. September 1st wheat stocks came in at 2.37 billion bushels, more than pre-report estimates. The higher number indicated demand likely down eight percent from last year. Part of the reason may be slower than expected exports during the marketing year.